Growing up I dreaded the nights we had pork chops. Then when I started cooking and seeing all kinds of delicious looking recipes for chops I very hesitantly gave them a second chance. Turns out I just didn’t like pork chops the way my dad loves them. 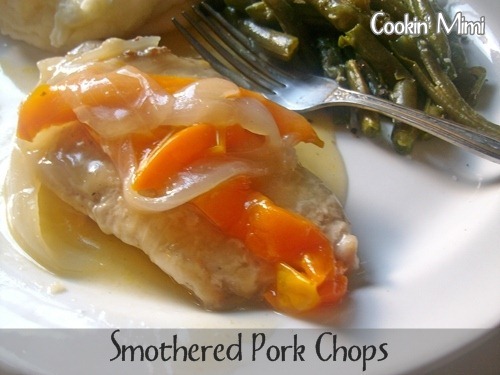 These smothered chops, my friends, are my very favorite way to eat pork chops. Fork tender with a delicious gravy and they go perfectly with mashed potatoes which is a bonus in my book. 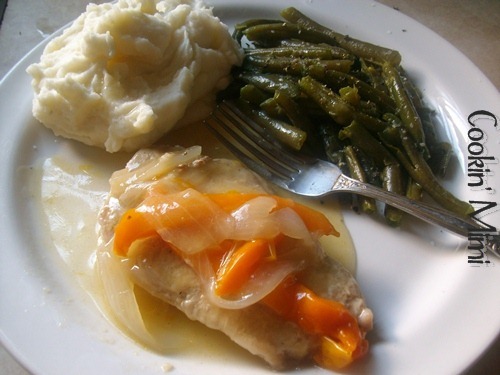 Fork tender pork chops in a tasty onion and bell pepper gravy. Total time: 1 hour, 10 minutes. In a plate or a shallow baking dish mix together the flour, salt, and pepper. Coat the chops in the seasoned flour and place in the hot skillet cooking for 3-4 minutes on each side or until golden brown. Remove and set aside. Add the onions and peppers to the skillet and cook for 2-3 minutes or until softened. Add the garlic to the onions and peppers and cook for another minute longer. Place the chops back in the skillet and cover with the onion, pepper, and garlic mixture. Pour the chicken broth over all and sprinkle with the Worcestershire sauce. Cover skillet with foil and simmer for 45 minutes. If gravy is not thickened to your liking mix the cornstarch and cold water and add to the skillet, cook for a couple of minutes until thickened. Season to taste with salt and pepper. WOW!!! Does that look good!!! Wish I had been at your house the night you fixed this meal! lol…! These look yummy. Thanks so much for sharing at the Weekend Potluck! Have a great weekend!